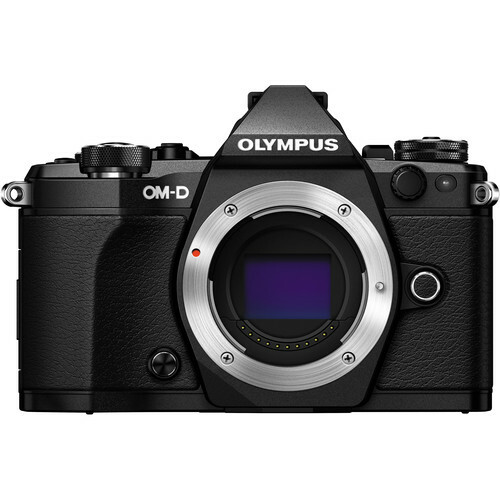 The black Olympus OM-D E-M5 Mark II Mirrorless Micro Four Thirds Digital Camera combines a 16MP Live MOS sensor with a TruePic VII Image Processor for increased performance speed and reduced noise throughout the ISO range as compared to TruePic VI. The Mark II also improves upon its predecessor by utilizing a 5-axis VCM Image Stabilization that provides up to 5 stops of compensation. Full HD 1080p video recording is now available on the Mark II with a higher bitrate of up to 77 Mb/s and various codecs. Built into the E-M5 Mark II is a unique feature that utilizes sensor shift to produce a 40MP image by combining 8 images in-camera. The camera's fully articulated 3" touchscreen LCD monitor makes taking self portraits easy, and the built-in WiFi lets you quickly share your images. When not using the LDC monitor for live view, the 2,360k-dot EVF provides a virtually lag-free view with a 1.48x magnification. Rental Includes: Body, strap, body cap, battery, charger, and 16 GB SD Flash card.